Three centuries on, the passionate affair between the United States of America and France shows no signs of cooling. As is usually the case with affairs, this one has to no small degree proved an exercise in self-definition. Because for Americans, at any rate, France — and, in particular, Paris — has long been more than a place. It's been an ideal, a standard against which Americans can test, shape and assert their national character. There's nothing new in this. For the "Founders" such as Franklin and Jefferson, France was, above all else, a civilised place that at the same time was not, delightfully, Britain. For the age that followed, France was the other place that had recently dabbled in "revolution", with all that meant and did not mean. Later, as the nineteenth century rolled on, France was the international capital of progress and cultural attainment, where the spectres of impacted racial hatred, civil strife and industrialised ugliness seemed, as long as one didn't look very hard, agreeably far away. The France of Gertrude Stein, Hemingway, F. Scott Fitzgerald and so forth restored to modernity a lustre that the carnage of the First World War might otherwise have tarnished indelibly. Next came, in no particular order, the German occupation, Camus, Sartre, Simone de Beauvoir, Bridgette Bardot, 1968, draft dodgers, Foucault, Derrida, Euro Disney and Houllebecq. And indeed, on and on go the rows, the name-calling and the splits, as well as the interludes of ill-disguised desire and passionate reconciliation. Most of all, though, France has allowed Americans who are that way inclined to say something intelligible about who they are, or at any rate who they wish to be. So for every American simmering with gee-whiz nativist contempt for all the things France might be seen to symbolise — which is to say, intellectualism, sensuality, frivolity and decadence, as opposed to the classic American virtues of practicality, decency, earnestness and healthy New World vigour — there's another American who wonders, with varying degrees of guilt, whether an old Chateau Latour and a volume of Collette's more feline stories might somehow have the edge on Garrison Keillor and a super-size helping of Liberty fries. Whisper it quietly, but — well, isn't there something about those cheese-eating surrender monkeys that's actually, when you come to think about it, pretty darned séduisant? The present exhibition at the National Gallery reminds us of one particularly fruitful model of Franco-American rapproachment. Americans in Paris: 1860 – 1900 sets out to survey the experience of those American men and women who came to Paris in the latter half of the nineteenth century in order to study art there, seeking to examine not only what they achieved whilst resident in the City of Light, but also how their time in Paris affected them once they returned, as most but not all of them did, to American shores. In achieving this goal, it must be said, the organisers have not entirely succeeded. This isn't surprising. The subject-matter, which superficially could hardly be more simple, is in fact fraught with hazards. How, for instance, to define "American"? As a nation largely peopled with immigrants of one vintage or another, it's doubtless fair to include artists who weren't born in the US but simply moved there at some point. It's probably even fair to include those who were born in the US but chose to live and die somewhere else. There's a bit of a difficulty, though, when three of the artists most central to Americans in Paris — Cassatt, Whistler, Sargent — were "American" only in differently complicated, problematic ways. And if not, what on earth does it say about the experience described in this exhibition that none of these three showed much desire to spend time in America? Come to think of it, though, "in Paris" isn't as straightforward a concept as all that, either. For while some artists stayed for a year or two, speaking American English to other Americans, attending their various American protestant chapels and generally entering into the swing of the so-called "American Colony", others, in contrast, shunned their fellow countrymen, learned to speak good French, and lost themselves in a luxuriously thorough otherness. So there were very different ways of doing that, too. Finally, since much of the work on show was painted outside France altogether, sometimes decades after the artist in question had last seen European shores, the organisational rigour stretches and sags in places. There's a strong sense that the rules have been bent in every direction to license the inclusion of a handful of superstar works, whilst at the same time some fairly second-rate stuff has also been allowed in for the sake of scholarly completeness. In places the gaps between the strongest artists shown here, and the weaker ones, are almost distressingly vast. The result can, like any dodgy fusion cuisine, feel confused, indigestible — and sometimes more than a little unappealing. All of this bothered me for about two minutes as I started to go round the exhibition. By the end, though, I hardly cared. The National Gallery — by any sane standard, one of the world's greatest art museums — holds, I think, exactly one American painting. (By "American" I mean, incidentally, painted by an American in the United States. And if you want to defend the notion that Sargent's great Lord Ribblesdale, perhaps the consummate statement of what an English milord ought to look like, should be considered "American", this site has an excellent comments facility — I can't wait to see someone try to make that case.) Here it is. It isn't exactly dreadful, but neither is it very good. Certainly, lurking as it does in solitude and obscurity, it hardly testifies to the breadth or quality of American art. And while other British collections include a number of important American paintings — one thinks here of Tate Modern's Rothkos — the emphasis is very much post-1917, even post-1939. It's almost as if the art that Americans produced in the twentieth century came either directly out of Europe, or out of nowhere. All of which matters for a number of reasons, not least because this narrative plays to the general British suspicion — long since implanted by Roger Fry, Herbert Read & Co — that most if not all worthwhile art made in the mid to late nineteenth century was necessarily created in France. As we shall see, British opinion was not alone in that particular delusion. But being reminded of the strengths of other national schools — what was happening, for instance, in the various places that are now Germany, Russia, Italy and the United States — is, if nothing else, a salutary prelude to discovering the real, serious strengths of Britain's own art history, still far less well known or loved than it ought to be, both abroad and at home. Down, anyway, from that well-exercised hobbyhorse, and back to the topic at hand. Here's the point. The real joy of Americans in Paris has less to do with Americans, or Paris, than it does with the opportunity to spend time with a handful of very striking paintings rarely if ever seen in London, as well as a host of other works which, if less exciting, still have the capacity to charm, impress or perhaps surprise. An American friend of mine, having heard me lavishing praise on this show, expressed surprise at my enthusiasm for "that sort of stuff" — but then admitted that he himself, however much he might love it too, probably took it a bit for granted. And the truth is, he probably does, because he lives in a part of the States where American art, good and bad and indifferent, is everywhere around him. It's different in London. And yes — to address my friend's other entirely reasonable objection — when compared to the best French painting, too often the American art of the 19th century lacks the lustre of the cutting edge, sometimes looking more than a little derivative, safe and sensible. But so does most art, most of the time. Why should that be a barrier to enjoying it? And anyway, a few paintings easily clear that particular hurdle through sheer force of brilliance. Yes, I do love "that sort of stuff", and hope that this show will make that sentiment more general, over here, right now. Americans in Paris has been organised in conjunction with two major American collections, the Metropolitan Museum of Art (New York City) and the Museum of Fine Arts (Boston). Both have been remarkably generous in their loans, as have other institutions, not only in the United States either, resulting in a large and sometimes spectacular show. From the National Gallery (Washington D.C.) comes James McNeill Whistler's Symphony in White, No. 1: The White Girl (1862), while that much-admired, much-parodied classic, Arrangement in Grey and Black, No. 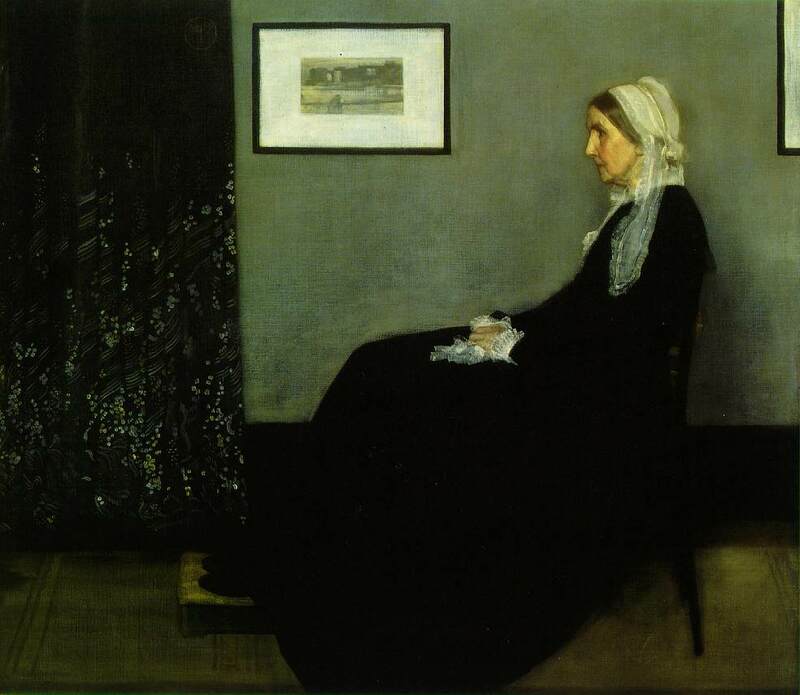 1: Portrait of the Artist's Mother (1871), borrowed from the Musée D'Orsay, occupies the same room. It's an exciting conjunction — two compositions grossly self-congratulatory in their obsession with formal issues, yet utterly different in emotional temperature — the one all sensuality and breathlessness, the other so stern and dignified as to seem, even now, like a sort of reproach. Elsewhere the exhibition includes an amazing Whistler seascape called Harmony in Blue and Silver: Trouville, 1865, loaned by the Isabella Stewart Gardner Museum (Boston). It was apparently painted while Courbet was working at Whistler's side, yet the work — and it's typical Whistler, this — almost aggressively rejects every last shred of the older painter's influence. And that, in a nutshell, is the sort of juxtaposition that raises Americans in Paris well above any flaws in its overall coherence. Wherever Whistler's national loyalties may have resided, whatever the influence of France (as opposed to Britain or Japan) may have been, these are canonical works by a serious artist. The London viewing public is, frankly, lucky to see them. And then there is Mary Cassatt. What to make of her? My own view varies. Sometimes I think that she's a tedious second-rater, her reputation engorged by the crude biological fact of her gender far more than by her talent, and her popularity largely contingent upon the accident that her painting and prints make really good greeting-cards, exhibition posters and decorations for the better sort of paediatricians' waiting-rooms. But come to think of it, such suspicions are at their strongest when I've seen too much of her work in reproduction which, by embracing its sweetness, rarely seems to do much of a favour for either its rigour or complexity. But how else to judge her? Again, there isn't much Cassatt work on show in Britain. Americans in Paris contains about a dozen of her paintings. Standing amongst these works — for there's a little room more or less devoted to them — I was really surprised at how strong they looked, and how little effort it takes to imagine what Degas saw in the very proper, very determined Philadelphia lady who became his pupil, colleague and lifelong very good friend. True, her drawing wasn't as tough as his, her forcefulness swaddled in the soft stuff of domesticity — but how many artists could bear the comparison? Here, if not all the brushstrokes genuinely thrill, at least many of them do. The colour clashes, reverberates, surprises. Cassatt's way of filling a canvas is more full of boldness, in the flesh, than it is of easy charm. Those sleepy, cuddly babies function well as softly solid forms, not just as the icons of cuteness that they also, incidentally, are. The third great star of this exhibition is John Singer Sargent. Britain is fortunate in its holdings of this infinitely elegant artist's work, present in public and private art collections as well as in an excellent exhibition at the Tate in 1988. We've had access not only to his society portraits, but to his landscapes, genre scenes and war paintings. So we can hardly say that we don't know what a good Sargent looks like, or claim to be surprised by his breadth or fluency. If anything, familiarity might lead, if not directly to contempt, then at least to a certain apathetic disregard en route to it. All credit, then, to the organisers of Americans in Paris for pulling off the remarkable coup du theatre they achieve here. For one of the best things about this show is the degree of visual drama that underpins it — something more familiar to the Royal Academy than the National Gallery in recent years, but entirely appropriate for this particular exhibition. 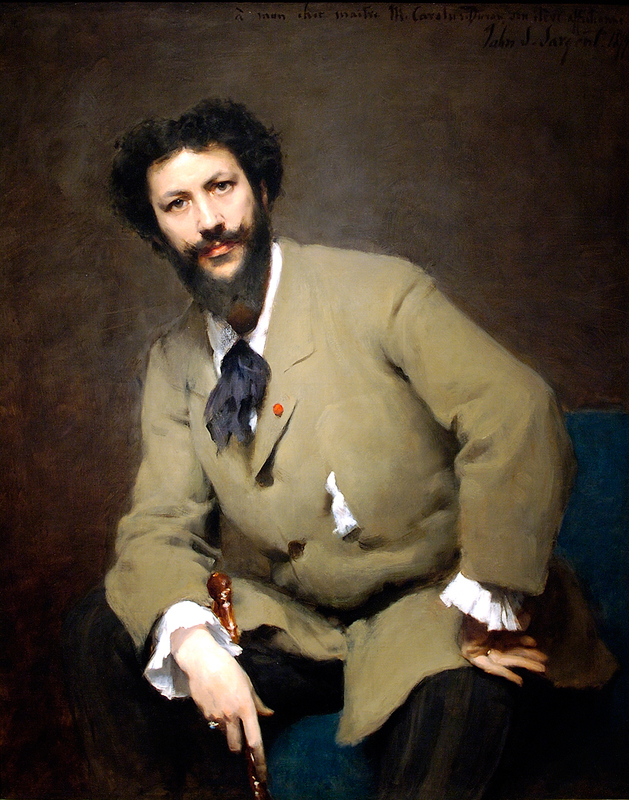 There's a handsome Sargent early on — a suave, voguishly monochrome portrait of that great dandy and self-promoter Carolus-Duran, whose studio offered a particularly warm welcome to rich, fashionable American art students. Painted in 1879, when Sargent was 23 years old, in a sense it effortlessly outshines everything else in the first room of the exhibition. Sargent's confidence appears complete and, what's more, well-justified. His ability to make a nondescript patch of taupe or umber flicker with interest looks back, meaningfully, to Velasquez, as does his contempt for the easy appeal of colour, or his ability to drive white into black, wet-into-wet, thus creating a cuff or a collar. What's more, though, this last trick was one that Carolus-Duran particularly recommended to his pupils, whom he also encouraged to "draw" directly onto the canvas with paint. (In the Luxembourg Gardens, also in this show, shows this strategy to full advantage.) So at several levels, then, this portrait of Carolus-Duran is a tribute to what France, or at any rate a single Frenchman, gave Sargent. At the same time, normally resident in Williamstown, Massachusetts, it's a lesson for any complacent London viewer in what Sargent was doing before he took up painting the British aristocracy. The real kick, though, comes a little while later. Two rooms on, turn to the right and suddenly the view through the long enfilade begins to register — it's Sargent's great portrait of the daughters of Edward Darley Boit, painted in 1882 in Paris. As regular readers will perhaps remember, I am no great fan of the basement of the Sainsbury Wing — considering it eternally pokey, airless, incredibly badly lit, etc, etc — but this particular view is one of the few gifts its design affords the curators, and there's little doubt that here they make the most of it. The Daughters of Edward Darley Boit (Museum of Fine Arts, Boston) is a very large picture (87 3/8 inches x 87 5/8 inches, apparently), and because the image itself includes a view into another room — with a broad hint of Velasquez's Las Meninas in the composition — the way the work is positioned encourages it to expand into something grander than either reality or its own richly mythic, symbolic status. Four little girls, kitted out in starched pinafores, each project an entirely distinctive personality, but are all the same made to share the space with a big Chinese carpet, an enormous porcelain vase, a hard-to-read item in Chinese lacquered red, as a half-lit doorway beckons beyond. Maybe it's the throw-away elegance of the muted colour, maybe it's the almost frightening formal power of the composition — or maybe, who knows, it's the unrelenting, unsmiling faces of the three younger sisters, whilst the eldest half-turns away into the darkness, driving the viewer's glance further across the canvas to the right, giving this painting a sense often present in Sargent's best work, of something left unsaid. Over the years, much has been written about this painting. Standing in front of it, or indeed a few dozen yards away from it, one suddenly understands why. Sargent is also responsible for the painting chosen by the organisers as the symbol for what they evidently hope will be a crowd-pleasing blockbuster show. In a way this is fitting, as Sargent's Madame X (1883-4) is a painting that says, in its own way, something particularly interesting, if not entirely positive, about the experience of Americans in Paris. The subject, Madame Pierre Gautreau, society beauty and wife of a very rich banker, grew up in New Orleans. When Sargent showed Mme Gautreau's portrait at the Salon in 1884, one shoulder-strap dangling down against her icy-white upper arm, the scandal that resulted was in part about the amount of bare flesh on show, and in part about rumours connecting her with a doctor whose portrait hung nearby, but was also in part rooted in anti-American feeling — resentment of the brashness, lack of subtlety and plentiful success with which so many rich Americans were launching themselves into the higher echelons of Parisian social life. It would be easy, given the fame of this work, to feel a bit bored by it, were it not for the fact that the painting itself is, seen up close, so amazingly odd. Sargent usually laboured hard at making the most spectacular effects seem effortless. Here, though, everything has a strangely laboured, almost awkward quality. The most alarming feature of the work isn't, as one might have expected, Mme Gautreau's décolletage, but rather, her profile. It's sharp as a newly-ground blade — hard, unfeminine, almost inhuman. Moreover, in defining its curves and angles, Sargent evidently worked and worked at the surfaces surrounding so that it almost seems to be carved, physically, out of the surface. Meanwhile the sitter's eyes are strange, over-dark smudges, and her skin has the faintly livid quality of a newish corpse. Heaven only knows what Mme Gautreau looked like in real life, but what one sees here has more to do with determination than with beauty, more to do with nerve than grace. When the work was received badly, Sargent responded by leaving Paris for London and America, taking the painting with him. Later, when he sold it to the Metropolitan Museum of Art in 1916, he called it "the best thing I have done". It's hard to agree, but at the same time, it's equally hard to deny that this gifted, shy, brilliant painter captured something of importance here. In the beauty of the lilies …. Although quite a lot of Americans in Paris is taken up with works by Whistler, Cassatt and Sargent, this is in fact a generously-sized exhibition, including paintings by quite a wide range of American artists. There are, for instance, a number of works here by Thomas Eakins. One of them — a huge, alarmingly life-like Crucifixion (1880) — turns out to be the fruit of sessions in which Eakins convinced a fellow-student to allow himself to be suspended from a life-sized cross while Eakins photographed and then painted the resulting image. There's a cold-blooded Yankee literalism here that only gains from its proximity to a particular strand of scientifically-minded spiritualism, very much the creature of Eakins' own time and place — and perhaps just a hint of guilty homoeroticism, too. Painted in America, it was rejected by the jury of the Paris Salon of 1890. An earlier work, however — Starting Out after Rail (1874) — shows another facet of Eakins' ability. Here a small boat sets out under sail on a brisk, bright, slightly windy day. The subject matter couldn't be more simple, but the colour is subtly brilliant, the composition stark — so much so, indeed, that a certain sort of critic, fond of lineages and national tags, might wish to connect it with a world of colour-field abstraction which, another sort of critic might argue, is entirely out of sympathy with anything Eakins might have intended. Still, it's a startlingly effective painting. And then there is Winslow Homer. Sadly, I remain, despite a certain amount of hard work, unable to understand exactly how Prisoners from the Front (1866) is meant to relate to the governing theme of Americans in Paris, aside from the fact that when he eventually travelled to Paris, the American-born, Boston-trained artist-illustrator for Harper's Weekly showed his picture at an international exposition there, where it could hardly have been flagged up more clearly as "American" — not only by the context, of course, but by the painting's then-topical subject-matter. Prisoners from the Front is one of small handful of paintings in which American painters came anywhere close to making serious art out of the bleakest hours in the history of the Land of the Free. (Photography, in the main, did a better job.) And although the catalogue for Americans in Paris describes this work as "confrontational", in truth, like the magnificent The Veteran in a New Field, it radiates ambivalence. Homer's painting doesn't depict a famous assault, or a gallant defence, or the great actions of massive armies commanded by supermen. On the contrary, its scale — emotionally, as well as physically — could hardly be more modest. A frieze-like composition laid out against a background of muddy-gold fields and cloud-curdled sky, it pictures the moment when an youngish officer of the Army of the United States (a family friend of Homer's, it turns out) confronts three recently-captured Confederate prisoners, fresh from the front at the battle of Spotsylvania. One's a dashing young cavalryman, hair long, expression arrogant, hand curled defiantly on the hip where his sabre ought to have been resting; one's a bewildered old veteran who's seen many a fight before this last one; the third is the spiritual forefather of generations of redneck trailer-trash, too incuriously stupid to wonder what kind of mishap has befallen him this time. Now, it's easy to read this trio as stereotypes representing what's wrong with the South, and hence why the North was right to crush its secessionist impulses — pitting obsolescence, arrogance and ignorance against progress, dignity and rationality, as personified by the Union officer. But it's also possible to see in it an attempt to humanise and soften one of the world's first mechanised, mass-conscription conflicts. The Southerners, for all their archtypical simplification, are by no means demonised. Rather, they are depicted with a degree of sympathy, understanding and kindness that argues more for shared humanity than for ongoing partisan hatred. Well, that's my reading, anyway. What the Parisians of the late 1860s would have made of it is even harder to know. Homer, in a sense, stands at the other end of the spectrum from lifelong expats such as Cassell and Sargent. Although he lived for a while in Paris, he soon returned to his beloved New England, not very much altered, as far as I can tell, by his time away. And this, in a sense, leads us directly to the major question raised by Americans in Paris. At what point does individual creative expression intersect with national identity? In other words, is there such a thing as an American way of painting, as distinct from a French way of painting? Was there something basically American both in what these young men and women brought east across the Atlantic with them, and in what, if anything, they ended up taking away from the ateliers of Paris? In a word, no — at least on the evidence of this exhibition. Part of this stems from the point made earlier, regarding the diversity of ways in which a person could be an "American" spending time "in Paris". There were so many different stories, different affinities and antagonisms, different frustrations and achievements. How to compare, for instance, Sargent's story with that of Henry Ossawa Tanner, a skilful, learned and sometimes inspired painter of Biblical scenes, who at the age of 32 decided to make Paris his home — and in doing so, surely avoided at least some of the bigotry that an Afro-American artist would have suffered in his native United States? How to compare Cassatt's trajectory with that of Elizabeth Jane Gardner? Having arrived in Paris at the early date of 1864, this enterprising woman initially made a living by copying paintings in the Louvre for American collectors, all awhile dressing up as a man in order to attend men-only drawing lessons. She not only studied (as so many American did) with William Adolphe Bouguereau, but in fact ended up marrying this pin-up boy of academic classicism — a fact which, with the benefits of hindsight, could hardly be more obvious from the glossy surface of the faintly alarming Shepherd David, on show in the present exhibition. The broad chronological sweep of American in Paris also tends to emphasise difference over similarity. The earliest works here are, I think, from the mid-1860s, whereas the later ones — including Frederick Childe Hassam's spectacular Allies Day, May 1917, a riot of French and American flags which bursts through the time-constraints of the exhibition with triumphant aplomb — take us well and truly into a place from which we can glimpse the high peaks of Modernism before us. So the lessons these Americans internalised in the ateliers, the crowded salons and the summer sketching-holidays, all of which might have started out forming direct trans-generational links with the shades of Ingres and even David, came at last to encompass Impressionism and its offspring. The shifts in subject-matter reflect this, in an exhibition that takes in everything from the Orientalist fantasy of Charles Pearce's The Arab Jeweler to the brashly skilful rendering of artificial light in Willard Metcalf's In the Café and the Art Nouveau eroticism of John White Alexander's Isabella and the Pot of Basil. These were, in other words, the work of different individuals attempting different things in different styles at various different times. Small wonder, then, that the overall impression is one of variety, not homogeneity. Yet despite this, it's clear enough that in a very broad sense, the continuing artistic traffic between France and the Unites States was to have serious and lasting implications for American art history. Young Americans, seduced by the effortless self-confidence as much as the actual merits of French painting, were quick to convey their enthusiasm to the folks back home. Several of the artists included in Americans in Paris went on to advise American patrons on acquiring French art, which does a great deal to explain the wealth of first-class Impressionist paintings to be found in American collections, both public and private. The impact on taste, both commercial and critical, was immense. In a virtuous circle, all the feelings about France that had propelled those students to Paris in the first place ended up reinforcing a particular notion of France. In particular, the burden of all those gilded memories of riverside picnics, the cool halls of the Louvre, the raucous bonhomie of the smoky cafes and faces half-glimpsed amidst the throngs in the crowded boulevards only increased the sense that France, more than anywhere else, instantiated culture in the highest, most Apollonian sense — rather to the exclusion of has-been high-art hot-spots like the Italian city-states or the Netherlands, let alone places like Great Britain that, for whatever reason, have never needed to add art history to their arsenal of state-formation tactics. And this, in turn, meant that when Old Europe seemed too tired out and torn up by war to sustain any longer the flames of artistic pre-eminence, the torch could only be passed to the United States, which was conveniently doing its darnedest at the same time to slip into the role of geo-political hegemon. Or something like that, anyway. Neat art-historical narratives, like the broader historical narratives in whose shadow they develop, trade not on the inconveniently lumpy stuff of individual lives — the sensitive and cultivated American, the boorish and Philistine Frenchman — but rather on the quality of their own relentless, remorseless streamlining. When they start to fall apart, there is something unappealingly messy and unsatisfactory in the result, however more "true" it may be. So if there's something slightly undigestible about Americans in Paris, it probably has as much to do with this, as it does with the exhibition's breadth, variety and complexity. And that, in its own way, is a sort of recommendation. Red, white and blue, what does it mean to you? Yet it's hard to untangle the knotted strands of art and nationhood, no matter how devoutly one might wish to do so. After going round the exhibition, I stopped for a coffee nearby. I ended up chatting with a man — young, a bit trendy, quite "normal" really — who'd been involved, in a marginal sort of way, with organising Americans in Paris. Well, the behind-the-scenes side of these things always interests me, so we spoke for quite a while about various aspects of the show — decisions about wall-colour, how high to hang a few key paintings, fiddly things that were done with the lighting. Eventually, we even got round to the merchandise available in the National Gallery's shop. He smiled ruefully, agreeing that this stuff would doubtless sell particularly well to the American tourists who were, he felt, the prime audience for Americans in Paris. I expressed surprise — surely British and European visitors would be interested, too? Especially when they so rarely have the opportunity to view American art of this calibre? His reply shocked me a little, but on consideration, I think he probably had a point. What he said was this: that it was a shame that the word "Americans" had to appear in the exhibition's title, because it would put far too many people off coming to see what are really, when one came to think of it, some pretty good paintings. Well, be that as it may, whatever France or, as far as that goes, the United States symbolises to you, please don't be put off seeing Americans in Paris — a show that, for its various flaws, is nonetheless both thought-provoking and beautiful. Dr Bunny Smedley was born in the United States, but despite her admiration for American painting, now carries a British passport. She lives in London with her husband and young son. What a delight to read! I do look forward to seeing the exhibition--I may have to reconsider my poorly thought out ideas on American painting. That will have to wait until it travels, of course. 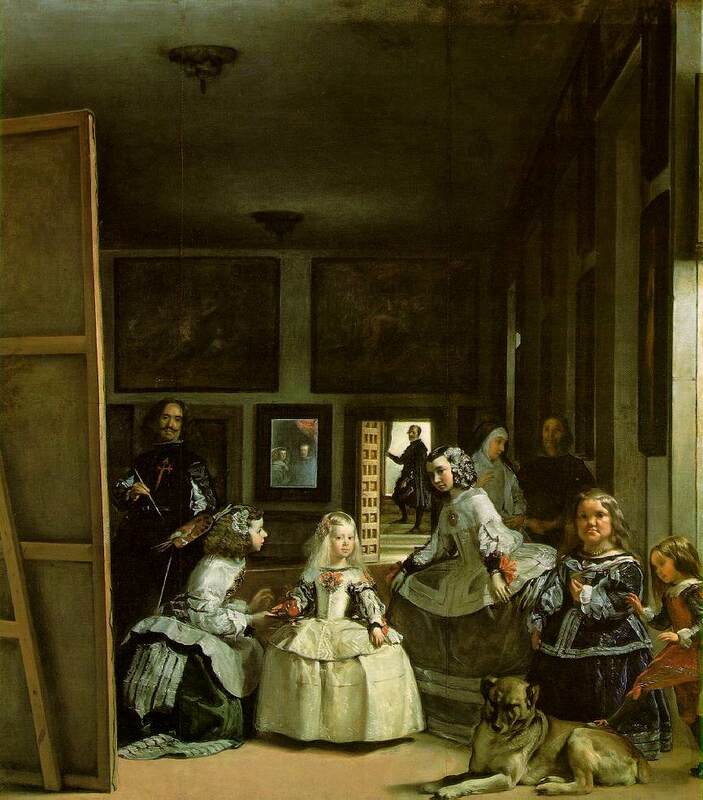 Along with Velasquez, Sargent may have been thinking of the portrait of the Bellelli family by Degas, who of course was also inspired by Las Meninas. Given the that the Boston Museum is one of the organizers, as well as the history of the period, it's not surprising that Massachusetts looms so large in the background of this exhibit (at least as described.) Whistler was a native son, of course, and Sargent's roots were there (not to mention his extended visit which thrilled the ladies of Boston.) Reading Dr. Smedley's review, I couldn't help but be amused to think that Sargent's portrait of Carolus-Duran normally hangs on the wall adjacent to the Bouguereau to which she refers, at Williamstown's Clark Art Institute. The American enthusiasm for French style finds full expression in that collection. Just as a suggestion, but if the exhibition fails to answer its own questions about the nature of American art, it may not only be because these are difficult in themselves, but perhaps because it documents a transition. I'll admit that's not fullly satisfactory, but I must run now. Thank you for the illuminating review. As usual, Bunny Smedley has written a fine review which achieves what a true critic should always achieve, and that is to explain to what is was like to be there and what she saw. I live in Australia, and Mrs Smedley's review makes me wish to jump onto a plane and go to London to see the exhibition. Does Ms Smedley write for any major British publication? If not, it is a crying shame, for she has a way of talking about art that appeals to the educated layman that puts most art critics to shame.